As part of Reader’s Legacy’s Rowling celebration, they’ve provided me with a few Guest Posts to draw attention to their Sale (through 4/30!) and a Grant Program created in order to give away 1 million physical books in support of literacy programs — be sure to check those out! “I pinned my 1st rejection letter to my kitchen wall because it gave me something in common with all my fave writers!” – J.K. Rowling via Twitter (March 25, 2016). What do literary geniuses, J.K. Rowling, Dr. Seuss, F. Scott Fitzgerald, George Orwell, and Agatha Christie all have in common? Surprisingly enough, each of them have written books that were rejected by multiple publishers. As hard to believe as that may be, it’s entirely true! Contrary to popular belief, rejection more than anything is a learning opportunity. Of course, no one welcomes rejection. In fact, they avoid it at all costs. But everyone gets rejected at one point in their life, or another, and instead of dwelling on the pain of being told “no”, they can use that rejection as a motivator – the greatest motivator in their life! 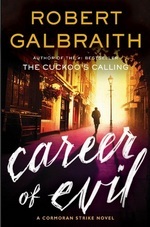 On March 25, 2016, J.K. Rowling took to twitter to share two rejection letters she received on her crime novel, “The Cuckoo’s Calling”, written under the alias of Robert Galbraith. While Rowling’s “Harry Potter” series has sold more than 400 million copies to date, Rowling admits to having self-doubt. “I wasn’t going to give up until every single publisher turned me down, but I often feared that would happen” she explains. Despite these fears, “The Cuckoo’s Calling” was eventually published by Sphere Books, an imprint of Little, Brown & Company, and the rest is history. Rowling didn’t allow the fear of going unpublished stop her from trying time and time again, which is an example many dreamers can learn from. Yes, rejection bruises a person’s ego and, more often than not, forces them to go back to the drawing board, but sometimes that’s the best thing a person can do. Going back to the drawing board means making improvements both personally, and in one’s work, and making those improvements brings the motivation to pursue that passion even further. Remember, rejection isn’t a death sentence, but merely a stepping stone which brings you closer to finally hearing that “yes” you’ve been waiting for. Though it might sound crazy to hang a negative note about your life’s work up on a wall, it can serve as a reminder to persevere…and when you achieve your success, it will be a reminder of all that you’ve overcome. Galbraith wastes no time in establishing that our criminal is one sick dude right there on page 1. By page 3, you know that this guy is at best some sick, misogynistic creep — and probably something worse. I really appreciated that — none of the silly trying to fake us out with charm, or attempt to make us sympathize with the guy — nope, he’s just a horrible person. Thankfully, this isn’t one of those detective novels that tells you who the killer is in Chapter 1 — all we know is that you don’t want him dating your daughter (or anyone you know — or anyone, ever) and that he’s a little obsessed with Strike and Robin. When your assistant receives a woman’s leg in the mail, you pretty much have to assume it’s personal. So naturally, Strike (and the police) aren’t looking to the public at large to start compiling their lists of suspects, but to Cormoran’s past. The fact that he has a list of three strong candidates is pretty disturbing, and while he and Robin look into the current whereabouts of each of these, we get to learn a good deal about the suspects and their history with Cormoran. Clearly he’s seen plenty of evil in his career — we knew that already, but this is the first that we really get details. Wow. How he’s managed to get this far in life and stay pretty adjusted is a marvel. As a P. I., as Military Police, and as a teenager Cormoran ‘s seen the worst of humanity and keeps going. Of course, the title also refers to the suspects, all of whom have pretty impressive (for lack of a better word) résumés when it comes to evil. 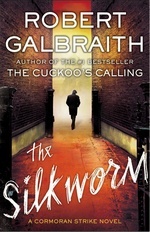 While Cormoran and Robin are on the hunt (while trying to service existing clients), things get worse — there are new people tortured, cut up, stalked and killed. And all of the initial suspects stay suspects. Each of them, in their own special way, has shown propensity of violence, a contempt for women, and a desire for revenge that could conceivably drive them to these acts. You can’t say that Robin Ellacott has much of a career related to evil, but it turns out that her experience in the field is more than theory and observation. Galbraith gives us a look into her past as well in this novel. Receiving a body part in the mail is mild compared to some of what she’s experienced. Even more than getting pieces of her boss’ backstory, I appreciated learning this about Robin (and it solidified my low opinion Matthew). While we’re getting that, we also see her growth as a P.I., holding her own (for the most part) with Cormoran. Until she reaches the breaking point, that is, which you’d expect when some psycho is threatening you as a way of tormenting your boss. Thanks to a combination of ambition and a desire to maintain (take?) control over her life, she — as one friend of the blog put it — “goes and does something that is monumentally stupid.” I bought it, but…man, Robin let her insecurities get the best of her. How human of her. Galbraith keeps the tension turned up to at least 8 (sometimes, up to 11), while exploring the myriad ways our own psyches, pasts and insecurities can lead us into all kinds of trouble. I’ve enjoyed each installment in this series, but I think this one is the best, and I can’t wait to see what’s next (assuming Galbraith’s alter ego has time for it). Cormoran Strike is back, and I couldn’t be much happier. After the events described in The Cuckoo’s Calling, Strike’s enjoyed a few minutes of fame — a degree of notoriety with the police, and a profile big enough to land him bigger clients, plus his fair share of would-be clients with a weak grasp on reality and/or not a lot of money. Leonora Quine certainly appears to be in the latter camps when she comes to hire Strike to find her missing husband — but he sees an opportunity to collect eventually, and he likes her. The missing husband, Owen Quine, is a writer of some measure of success and renown. He’s been known to disappear for a few days every now and then, but this time seems longer, and with a special needs child at home, Leonora needs her husband back. Something’s fishy, and his soon-to-published next book is at the heart of it. While juggling his other clients — the ones with large checkbooks — Strike starts poking around, and it doesn’t stay a missing person’s case for long. Cormoran Strike continues to be reminiscent of several mystery fiction types and specific characters — yet he still feels mostly fresh. There’s your typical hard-boiled loaner (Spillane, Spenser, Marlowe, Cole, etc. ), the armed services background (same list, come to think of it), the troubled family history, and so on. There were a couple of detectives that I kept coming back to this time around (and I’m probably alone in this, I realize). Strike’s musings on the way he still works like he did in SIB removed me of the way Danny Boyle talks about John Ceepak. It’s odd to see the two ex-military men in the same light, while on opposite sides of the Atlantic. Yet, it’s also incredibly fitting. Strike and Robin also remind me a great deal of Yancey’s Highly Effective Detective and his assistant. Except Strike actually is highly effective. The description of Quine’s new book in question was fantastic — it is not a book I want to read, in any shape or fashion, but I really enjoyed reading about it. Galbraith is able to give us enough to get the idea without having to take the time to compose another book in the process — very well done there. This is slow, yet deliberately moving (like the protagonist, really) until it doesn’t need to be any more — once the pieces are in place and it’s time to reveal and trap the killer, then it moves on at a brisk clip and forces the reader to pick up the pace, too (or at least it felt that way). But it never drags, never meanders — it’s always on point, and is building to something. It’s tough to say that Strike develops much over the course of this book — we grow in our understanding of him, but he’s pretty much the same man at the end. Not so for Ellacot — she grows and becomes stronger throughout, and its only a matter of time before she’s going to be a 50-50 partner in the agency, I bet — and maybe Strike’s partner in other ways, too. I’m looking forward to watching Galbraith develop this character more in the books ahead, but I can tell I’m already getting impatient for it to happen, rather than trusting him and his timeframe. The other supporting characters not involved in Quine’s disappearance are great additions and make everything better, helping us understand the characters more (e.f., Strike’s family, Ellacot’s family — still not the fiancée, Strike’s old friends). As I read the last couple of paragraphs and closed the book I noticed something — I was smiling. Not a usual reaction for me as I complete a book, no matter what it is. That has to say something, doesn’t it? * Unless, of course, she’s talking about a little town called Pagford and its residents. Then there’s nothing at all that will grab you. A briefer version of this appears on Goodreads. I have to admit, if I didn’t know the name that’s on Robert Galbraith’s birth certificate, I don’t know that I’d have picked this book up. It’s possible– I pick up odd mysteries sometimes(the U.K. cover would’ve been more likely to get me to do it than the U.S. cover). But by the time I was halfway through with this one, I was ready to buy the next 2 or 3 in the series, regardless how this one turned out. I don’t know, man…I just don’t know. Our entry into this world comes via Robin Ellacott, newly moved to London with her fiancé who comes to the office of a P.I. as a temp secretary. She’s smart (and we eventually get an idea just how smart), spunky, and has long had an interest in detecting, it turns out (which must be nice — I’ve never had a temp job that was in a field I’d been interested for years and years). It’s through her eyes that we get confirmation that yes, the protagonist is a decent guy, despite problems he might be having — and a good detective. While we are introduced to this world through Robin’s eyes, we eventually get to the point where we envy her as she gets to take part in the investigative work. Her temporary boss, on the other hand isn’t someone we envy — nor is he noticeably spunky, there’s reason to doubt his intelligence from time to time — although he’s clearly an experienced and well-equipped detective. Injured in Afghanistan, he now (almost) ekes out a living doing private investigations. He has an interesting — and novel — past, one that opens doors for him (although he hates having to cash in on it). With the unlikely (but inherently cool) name of Cormoran Strike, he’s a member of a long-line of down-on-their luck, idealistic, hard-boiled, hard-drinking, lone-wolf detectives that goes back to Chandler (if not further). The friendship that Strike develops with Robin gives him the motivation–at least temporarily — to be a better version of himself than he’s apt to be, if only to pay her back for the extraordinary amount of help she’s been to him. It seems inevitable from almost the beginning that thus will develop into at least an unrequited love on his part, as long as Galbraith moves the relationship along in future books as deftly as she does here, I don’t see it becoming the cliche it so really could. 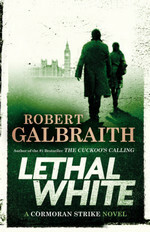 Given the subject of Strike’s investigation — a well-known model from a prominent family, who socializes almost exclusively with A-listers — Galbraith is given plenty of opportunity to comment on celebrity culture –a subject Galbraith has had a certain degree of experience with, and obviously an informed opinion or two about. Hard-boiled detectives tend to comment on society as they go about their detecting, and Cuckoo’s Calling does its fair share, particularly regarding the paparazzi and tabloid journalism, as well as the ridiculous aspects of the lives of celebrities. The case that Strike is hired to investigate has plenty of twists and turns, more than enough to keep those who don’t care for the rest of the book entertained. I was pretty sure who the Big Bad was early on, and I was right. But I wasn’t in the same time zone as the motive. I was about 50/50 on some of the more minor mysteries, which is nice — for a first time mystery author, I’d have expected to be right about 70% of the time or so. But when I was wrong — I was very wrong. I should add that Galbraith didn’t cheat — everything we needed to know in order to identify the villains of the piece is right out there for us to see, just wish I’d done a better job of it. A solid set-up for a series, decently interesting characters, and a mystery solid enough to prove that this newbie author (at least in this genre) has some chops. A distinct pleasure. I’ll be waiting for more Cormoran Strike — no matter what author’s name is attached. Without knowing what name is on Robert Galbraith’s birth certificate, I’m not sure if I’d have picked this up off of a bookstore shelf — can’t imagine I would’ve nabbed it at Amazon or Kobo, etc. Maybe, maybe, I’d have grabbed it off of the library‘s New Book Shelf. But at 47% of the way through? I’d be waiting for the sequel. Really enjoying this. This is not the Rowling of Harry Potter — as it should be, that wouldn’t work for this audience. Even better — this isn’t the Rowling of The Casual Vacancy — thankfully, mercifully, not that Rowling.